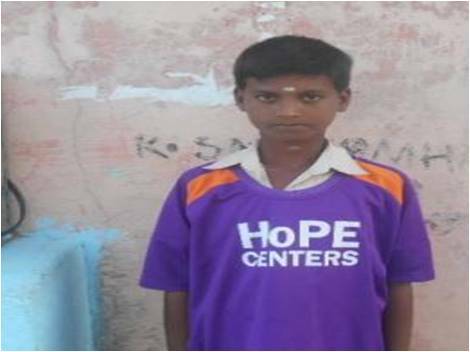 Munusamy is in the 9th grade in Sembedu, India. Along with his parents and elder brother, he survives on very low wages. Yet, in spite of being financially poor, he is rich in spirit. He loves to dance and works very hard to achieve excellent academic marks. Most importantly, he wants to help others and therefore often takes time to assist senior citizens in his village. He also recently committed to provide for his mother and father in their later years. In order to achieve these goals, Munusamy decided to pursue a career in the police service. He has diligently collected information about becoming a police officer, both physical fitness requirement lists and educational materials. Like many of the children who attend HoPE Learning Centers,. Munusamy has grown through social and career-oriented experiences. Yet, so many other children across India are still unable to reap such rewards. Join us at Tripura Foundation in our commitment to provide this valuable resource to as many children as possible in the coming year. Your contributions will help change the lives of smart and caring young people like Munusamy. Thank you!.